I also use chalk and carry a pair of channel lock pliers. I hate finding a BM with the screw top that hasn't been opened in forever and I can't budge the top. I grab the pliers and bingo I can get it open. It's good as long as you use a mixture of lead, oil, and stem cells bind it. I like the photos with just the letters highlighted in white. The later ones with the chalk work, but are not as neat. In the NGS photo specifications, (see: http://www.ngs.noaa.gov/ContractingOpportunities/SOWV7.pdf (beginning at page 165)) we originally suggested yellow crayon because that's what came to mind when we started taking photos in the office and wanted to make the lettering stand out. For cleaning off the disk prior to the photo, I like to use a hand-held straw whisk broom. 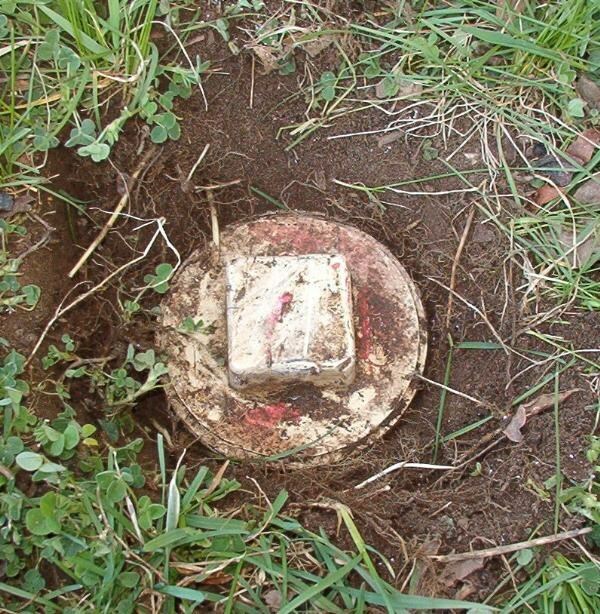 For finding buried marks, the NGS field crews used to use a "tile probe". This is a long steel rod that can be used for prodding into the ground. They are still available, and can be found by doing a web search. I used to have a box in the back of my car for BM hunting. It would be interesting to hear what everyone carries. I also liked the comments about the sun angle. There are some other good, I think, ideas in the web link above (like knowing the minimum focusing distance of your camera). No! We're playng poker, not bingo! Don't give those old farts any new ideas! Where am I going to find a benchmark labeled B 12, anyway??? Oh, those plastic screw-top thingies with the rods inside? I haven't found too many of them, and they've all been either broken, or not screwed in. They don't seem like a terribly good idea. 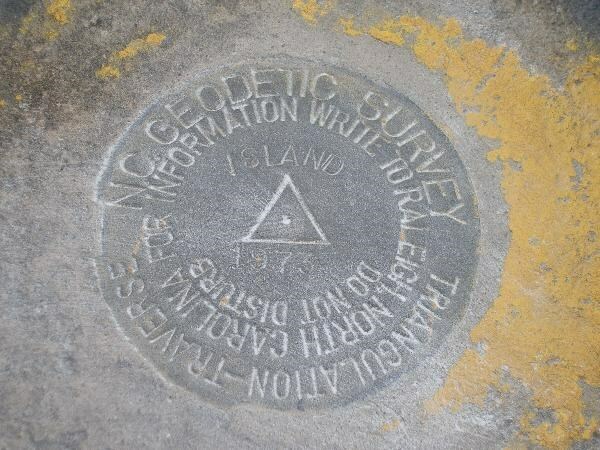 ... For finding buried marks, the NGS field crews used to use a "tile probe". This is a long steel rod that can be used for prodding into the ground. They are still available, and can be found by doing a web search. I used to have a box in the back of my car for BM hunting. It would be interesting to hear what everyone carries. can you please explain what you mean? I am pretty new at this. HI, cousin Pink! Nice to see another dolphin here! Hmm, I've never seen the screw top type. I always seem to run into the hinged lid ones when I don't have a screwdriver on me though. (And for the record, ball point pens do not make a good tool for opening them). That mixture is OK, but you need some PCBs to make it flow properly. I noticed a comment about using a tooth brush to clean the mark. 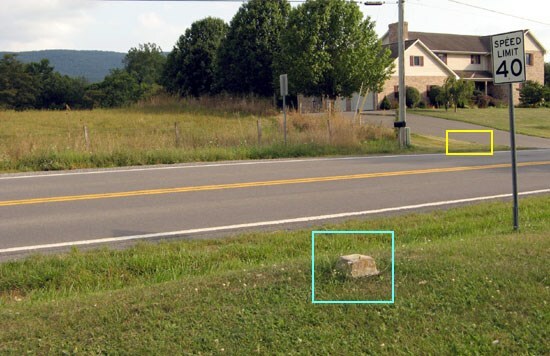 This can be a little difficult when the mark is below the surface. The angle of the handle on the brush is wrong. Some of the newer brushes are worse with their angled head. I’ve bent the handle on tooth brushes by heating up the point I want to bend over a candle. Hold it several inches above the flame so it won’t get too hot. After a few seconds it becomes pliable and you can bend it to the angle you want. Hold it for a few more seconds until it cools and you’re done. If you want to you can bend the handle all the way around behind the head. That is a cool tool! I might consider getting one if it is cheap enough. I have had good success with Wal-mart camp forks. They cost about $3.00--just rip off the fork tines and you have a probe. They bend pretty easily and once they do they are pretty much useless. I typically have 2 or 3 in the car at any given time. Click on the picture, you will get the details. List price $9.97. I think I paid around $6 or $7 at Home depot. Yeah, I did that, AFTER I posted of course! The price is right but it is too short. For now at least I will stick with my 30" camp fork(s). The website only lists a 'set of three', but the brick-and-mortar stores (Harbor Freight) sell them separately. I bought one of the big ones, cut the chisel-like end off and ground the tip to a fairly sharp point. It's probably 'too short' for mloser , but his camp fork would not penetrate more than an inch or two in the Arizona hardpack without bending. This baby will never bend, and it doubles as a jack handle if you get a flat! I don't want a sharp point. If I miss seeing a sign for an underground cable I want the probe to stop or deflect rather than penetrate it. Nice screwdriver Papa Bear...I've got a screwdriver in my kit, but I hadn't found one that long. I'll need to look harder. Until then, I've got the camping fork like mloser, which has served its purpose. I bent it once when I was attempting to use it as a pry bar, but got it back mostly straight. I also use a small whisk broom for sweeping off disks, and have a small plastic composite gardening trowel/scoop for light digging and probing in sandy areas. Other items in my benchmarking box include a 100' steel tape, a hammer and a few long nails (for holding the end of the tape if necessary) a compass, work gloves, and a Stanley flatbar. I had an extra one of these, and it can be useful for some excavating when necessary. I also carry cornstarch, now in a plastic tupperware type container. For some inexplicable reason, I chose a small glass jar to carry it originally...it was available, I guess. Hope I didn't give the Canadian National crew a scare a few weeks ago after I dropped it and it hit the rail. I'm sure that it's common terrorist practice to scatter anthrax on rail lines in remote areas. 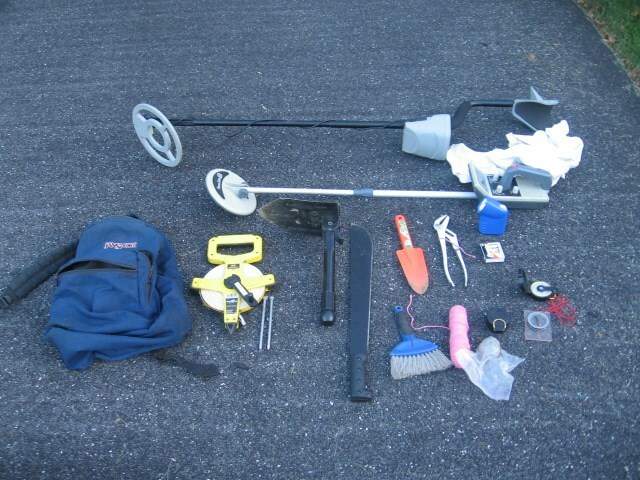 I also regularly carry a short handled dirt shovel and the metal detector in the trunk. Yeah, I was just meandering around in a Home Depot when I got to the screw driver section and suddenly thought "benchmakrk probe" - I asked "What's longest screw driver you have". He showed me this thing which is almost 2 feet long. I thought the shaft was aluminum (obviously I don't know hand tools - you don't make them out of aluminum), but it's steel. Cheap too. I said "looks like it could break". Salesman says "Guaranteed. If it breaks bring it back and get a new one"
Here is what I carry. At the top are my two metal detectors--a good quality one from Radio Shack and a cheapie from Harbor Freight. I have yet to find a time where the RS one worked when the cheap one didn't but I carry it just the same. The metal detector comes with me almost every time I get out of the car, unless I am hiking somewhere to find a mark that will "most definitely NOT need a metal detector", at which time I arrive to find that I need a metal detector. This small detector has a retractable head so it is possible to stick it in my backpack to carry, with just the head sticking out. It looks sort of like I am receiving signals from outer space when I carry it that way. Between the detectors is an old shirt, used for wiping dirty benchmarks, or my hands. At bottom left is my backpack. It has had a broken strap since KW2987 (tip: don't expect to carry 57 lbs in a school backpack. It is hard on the shoulders and the backpack). It has just been replaced with a new one. Next is my 100 foot tape. It is a cheapie from Lowe's but it serves my purpose. I am not building a nuclear reactor here, just measuring reference distances. If I am off by 1/2 inch or so I can deal. Beside it are two spikes that I use to hold the dumb end in place. Then there is my folding camp shovel. It is pretty heavy but has served me well. I broke a lighter one, but this one is very sturdy, and has been used to dig down 3 feet (JV4772). Then there is my machete. I tend to leave this in the car unless I think I need it. It is sort of scary looking and a real pain to carry. It also isn't real sharp so it is less useful than it could be when I DO decide to use it. After that is my cheap trowel, now lost and gone, left at some benchmark site most likely, and below it a brush that came with a small dustpan. Next in line are a flastlight, extra batteries (4 of them, as my cam uses 2 and my GPSr uses two and they seem to run out at EXACTLY the same time, most often when I am over a mile from the car), a wrench for those stubborn PVC pipe lids, 3 compasses of various styles and in various conditions, and finally some pink string and clay. 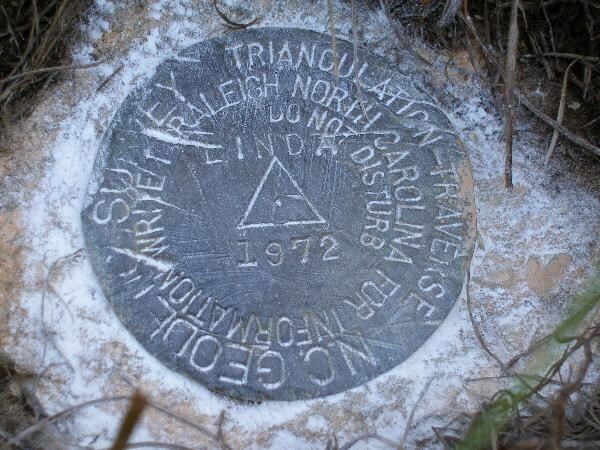 I used this one time to look for KV3859, which had four reference holes--I ran the string across the holes to find the center point and hopefully the mark. The clay was used to hold the string to the surface. The string worked fine but the mark seems to be gone. Not shown are my Wal-mart camp fork and a 100 meter tape that is in the car. The 100 meter tape broke the first time I used it--the ring that I staked down broke. I stuck a nail through the end but have only rarely used it since. Also in my car is a box of datasheets for 5 counties in my normal search area, 20 quad maps, mostly for areas I have hunted to extinction, a spare pair of shoes and socks, about 10 empty soda bottles, various candy bar wrappers, a lot of dirt and mud, etc. Also in the car is a 3 lb sledge that has been used to free destroyed marks from their homes. Sharp was meant as a relative term, it's now shaped more like a bullet after a few uses, and I like it that way. Real tile probes seem to be mainly in the $35–45 range, T-shaped, around four feet long, with a steel shaft and, in some models, a replaceable tip. Some have padded handles, such as this one, which promises "comfortable grips for penetration in difficult conditions." The same vendor, Forestry Suppliers, has several other models for your browsing pleasure. It isn't a race, just a weekly / bi-monthly hash event. There are hundreds of chapters/groups around the world. Basic premise is that it is 'a drinking club with a running problem'. It is a fun group and a great way to get out and enjoy the environment. since the runs are all over town, I'll often go early just to hit a couple of local caches. Based on a post in another thread - I think I am gonna go out and buy a heavy duty dowel and paint it yellow - so in the event I am taking a picture of the benchmark in its surroundings - I can place the dowel in the ground next to it so to make the spot easier to identify. I had a cheap orange handled screwdriver I used for this, but it disappeared from my kit at some point. Then I used my orange trowel for a while (see above pic) but that too is gone now. I tried the baby powder trick on 2 benchmarks, one yesterday and one today. I like it, it seems to work well. I used a small paint bursh (for trim) to brush off the excess. OK now for the Grand Finale of the Weekend Expedition,for previous discussion look in the Poker Run Logging thread. As stated I made it through all the tests the Officer had for me. Now comes the hard part..................empty your pockets!! Now see if you can explain this in terms an Officer of the Law and His drug sniffing dog will believe. Now you have to be convincing. I'm thinking it may be interesting to write a book, or at least a short story based on an experience like yours that doesn't turn out quite as well as yours evidentally did, since you're still "at large" and able to get on here when you want. Actually I think the drug sniffing dog was your salvation. Without the dog signaling the presence of drugs the officer was more likely to believe you. I hit a couple of spots on Tuesday where I did not want to linger, and pull out my white powder. A day care center in a church in north Newark where I jumped the fence , for instance. Or the Wood-Ridge High School. So the 2oldfarts will have to take that into consideration. It can also get a bit messy after a rain, like yesterday morning. Oh, well. I am not sure what your confrontation entailed but I am willing to bet that the officer overstepped your rights when he asked you to empty your pockets. While you can win more friends with sugar than sh*t, I think it is very important to keep in mind the rights you have as a US citizen , 9-11 or not, and they include the right to remain silent, and to not be searched without consent. I have been confronted by an officer only one time and the officer proved helpful, if somewhat reluctantly, in my search for a mark. The course I took in that instance was to be friendly and forthcoming, but I had no intention of letting him search me or my car, despite there being NO chance of illegal substances or contraband in either places. I don't recall if he asked to see my driver's license, and if he did I showed it to him, but as a pedestrian I need not have done even that. Well, acttually I was in my car when he pulled up, and that means he probably had the right to see it. I try to balance my rights with my desire to be a good citizen and to be helpful, but I would never consent to be searched. I really can't even imagine a meeting with an officer heading that way--I am never anything but smiles and helpfulness no matter who I meet. Must be my honest face! For those of you who want to know your rights take a look at these two documents: The first is from the ACLU. I am not a proponent of the ACLU at all. I feel they promote the rights of people who deserve none, or promote rights based on false criteria, but they certainly know about rights. The second is from a city government web site. It has much of the same info in a slightly different format. Photography buffs have done quite a bit of research on this topic also, and there is a good treatise here. You may have the right to refuse a search, but if you do you better expect a citation for parking too close to a roadway, destruction of state property (the grass you pulled to see the disk), any burned out tail lights, and anything else he can think of. I was wondering about that...used to use a crayon to make the numbers on polyhedral gaming dice readable. This would work well in flickr. Then if one hovers over the little boxes, the stamping on the marks could be made to show up! OK. It's not biodegradable. Most rocks aren't. 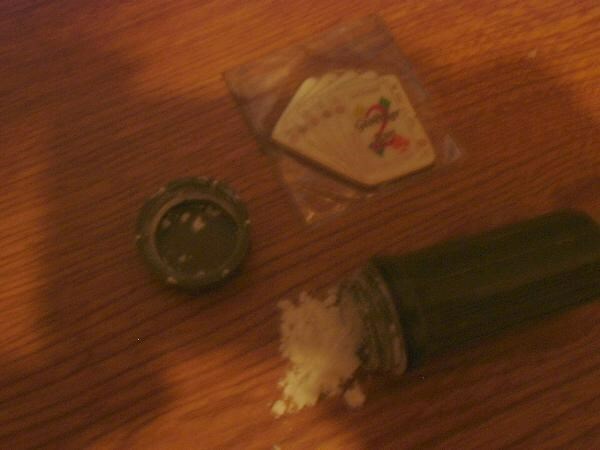 If talcum is volcanic rock, what's it going to hurt? But what to do with the mercury! This is a satire(story) about cornstarch and one of you hit the nail on the head. I was nothing but smiles ,and everything went as good as could be expected of the situation. I was not searched,but...................it was in my pocket and on my mind....and I was thinking ahead. I do know my rights and as you know I have had many "do not know the correct word",with all kinds of Officials starting with the highest one,The President. I am thankful that we do have people that watch secure areas. It was Sunday and I thought I could skate through,get a picture or 2 and be gone before anyone thought. In fact that is what startled me I thought I had done something else ?? What I could not imagine though. So thoughts of sugar plums were dancing through my head. We had a discussion a while back about why I did not like to put images of CORS stations on the logs,this adds to the reasoning there. And these are only listed at the NGS site. I am not one good at dragging things out and thought I had better let you all know things upfront. There are many who only watch this site. I did get a call as well from the National Map Corps about my ID. When I was explaining to the Officer about Benchmarks and mapping I thought it might be hady to show him this ID as well. A follow through was done by the Officer and he contacted Rolla. Rolla called me about it. So I am also here to explain things before they can go anywhere and seen as a little fun and adventure. And to show that things can happen and may not be what they appear to be. I guess that's why I am a GEO * Trailblazer 1. I hope my little satires and stories make it easier for the next person. Perhaps instead of a bottle of cornstarch or baby powder, bringing a piece of blackboard chalk might be less likely to draw suspicion. To use, get a nearby rock and grind off some of the chalk on it over the benchmark disk. I took the bait didn't I? I just want people to know that we do NOT live in a police state and to be aware of their rights. I am very happy that I defused my situation quickly and turned it into a positive opportunity. However, I was aware of my rights and made the decision how much I wanted to compromise them. I talked openly and honestly to the officer and was grateful he believed my odd but true tale (this was near the Phila Airport and was at a parking lot--the ladies who were working alone at the lot called the police). I respected his need to check me out. I explained what I was doing without appearing guilty of any crime and I think that helped me. BUT, had he asked to search me or my car I would probably have told him no,and taken my chances. I may try the chalk. I never had much luck with the various powders anyway and had stopped using them. I had pretty much stopped too but for the poker run I thought if I ran across one I couldn't get a picture clearly I might use it. I will never go to the big city with it again. I learned real fast on this one. I am really fond of original patina myself. If I would not have had it I might have ...well thats a different story isn't it? I have found that baby powder is more effective than cornstarch since it is a finer grain powder. It also has a unique smell that probably isn't similar to any type of drug. I carry it in a small plastic container which was originally used to hold lab chemicals. just point and squeeze, and the powder is released. Baby powder is available in very small travel-size dispensers. Since it would then be in its original packaging, it might not arouse as much suspicion as powders in an unmarked generic container. Am I the only one who thinks back to kindergarten and bring paper and crayon? In some areas (like military restricted areas), that's the ONLY way you can do it, because cameras are not allowed. Only did it once, years ago. Besides, digital cameras are much more fun! Being numbers hos, we went across the border at Calais, Maine to St. Stephen, New Brunswick. (Hey, three of us had never geocached in Canada!) We stopped at the motel first, to drop off the luggage (especially the wine and cigarettes!) "Why are you visiting Canada?" "Geocaching", exclaims my sister. "Park the car there, and go inside." A half hour later, the car had been searched. And they ran us through the computer. The crossing guard knew that my brother had worked in Ontario for six months. My sister is a QAS with DOD, with a secret clearance. And they told us where the nearest geocache is! Seven geocaches later, we returned across the border. "Why were you in Canada? ", Homeland Security asked, while the dog sniffed the car. "Geocaching", exclaimed my sister. Park over there, and go inside. The car search this time took forty-five minutes! Two hours of geocaching, and an hour and fifteen minutes to cross the border twice. It wasn't until a few days later that I remembered that I had a bag of cornstarch in my back pocket!! Good thing that the dog did not respond to cornstarch! Oh, well.